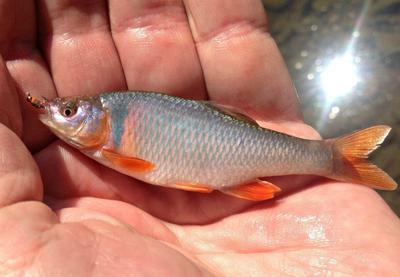 Red Shiners are the common local variety and I've caught a lot of them. But never a spawning male. I found a large school of them swarming around some Green Sunfish that appeared ready to spawn--everybody likes fish eggs. The blue and red coloring is really exotic. It's easy to see why these are a popular aquarium fish among collectors. I'm not sure there is a streamer fly small enough to catch one of these, but in the meantime I'm happy to finally have a picture of one of these beautiful fish. I used a size 24 Frenchy Nymph and my Soyokaze 27. Alan, Coach and I caught a lot of micros on size 20 and 26 Black Killer Buggers for the Killer Bugger challenge. A White Killer Bugger is a legal fly for the Streamer Challenge. It should work. You can always tie a streamer pattern on a small hook. Small streamer patterns exist. But when I'm fishing steamers that small it's usually just a nymph worked as if it's a streamer. Join in and write your own page! It's easy to do. How? Simply click here to return to Your Tenkara Stories. Currently processing orders that were received Apr 18.